Meet chalk artist, Tiffany Kelly! Have you heard about our Chalk It Up To Play contest? Artist Tiffany Kelly of Chalk N’ Awe will create a new piece of chalk art in a different Kettering park each week. 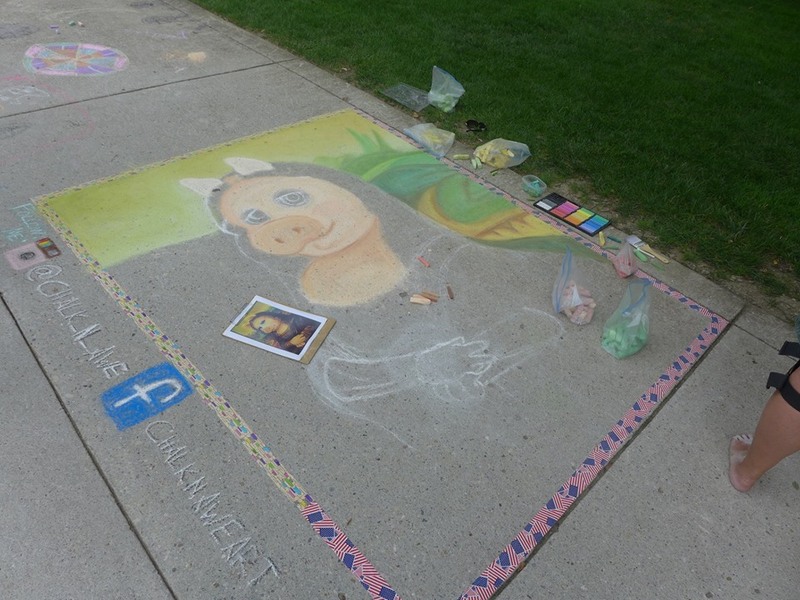 View the official Chalk It Up To Play page for details on how to enter and win a $10 Orange Leaf gift card, and read on to learn more about Tiffany and her artwork! How did you become involved in creating chalk art? Way back in 2012, my youngest daughter was almost 3. She wanted to play outside where the big kids were playing, but I couldn’t leave her out there alone, and she also refused to let me anywhere near her! I’d seen a bucket of discarded sidewalk chalk in the driveway, so I entertained myself while supervising the toddler from a distance. When/why did you decide to start a business with it? My intention was never to start a business or do chalk art for money. It was just something I did while hanging out at home with my kids. I’d chalked for some of the neighborhood kids’ birthdays, just for fun, and thought that maybe I could do other events. So, in 2013, I visited local farmers markets to see if they’d let me chalk, and they did! All through 2013, I voluntarily chalked anywhere that would let me. In 2014, I was contacted by several locations to chalk for them, including The Flying Pig Marathon, Air Force Marathon and Austin Landing. The following years continued to increase in demand, and a “business” just kind of happened. I’ve not only chalked at several locations in our area, but also Cincinnati, Columbus, and Clearwater, Florida. What is your favorite thing about the medium? My favorite thing about sidewalk chalk is that almost every kid has access to it. While I don’t work exclusively in Playground Chalk, it is the bulk of my arsenal, and I prefer it to much more expensive, “Artist” quality pastels. While these chalks do offer a much wider variety in colors, vibrancy, and longevity, they are cost prohibitive for many people. Working in a medium that is readily available to so many, and showing them that you really can make beautiful pieces without the expensive stuff is my favorite part of chalking. What do you find is the most challenging aspect of creating chalk art? Location, weather, and stamina. I am not ashamed to say that I am not an original artist. I typically recreate other artists’ work (with permission) or popular children’s entertainment characters. The challenging part of creating the art is the location, because not all surfaces are chalk-friendly; the weather, because rain is not chalk-friendly; and stamina, because chalk art is a full-body work out. When you get into larger pieces that take several days, you can get really exhausted. It’s important to be prepared for your chalk events, know where you’ll be so you can prepare for the surface available, check the weather and work with your hosts to work around any rain, and be prepared with lots of water and healthy snacks.